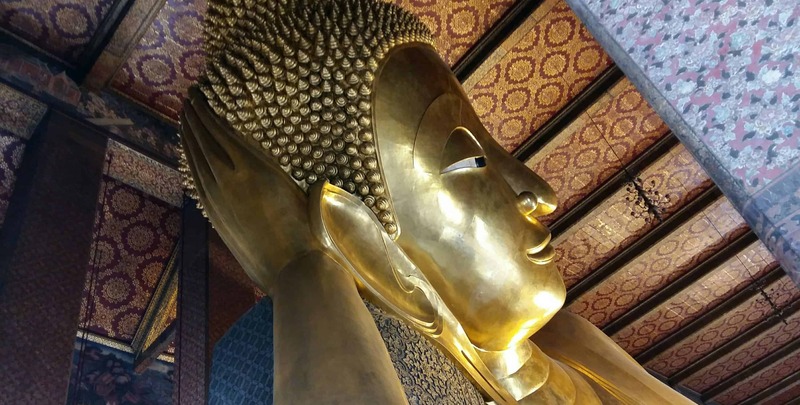 Wat Pho is a huge temple complex located close to the Royal Palace. Its main building houses a reclining Buddha that is 46m long. The temple is known as the birthplace of Thai massage, which is still taught here today. Chances are high that you won’t come to get a massage but to look at the giant Buddha and to walk around the complex. It is easy to get lost in between the many buildings and also to get away from the crowds that gather at the main building. Bangkok’s streets are heavy with traffic. Walking through the city, it is hard to believe that most of the traffic once took place on the water, in a time before cars jammed the streets. Escape the madness by taking one of the many water taxis that drive around the city. Not only will you get to your destination much faster, but you will also discover a different side of Bangkok. Muay Thai Boxing is all over Thailand. In Bangkok, it is very easy to find fights to watch. We went to Rajadamnern Stadium, a place popular with locals. I highly recommend this stadium as opposed to one of the more touristy shows. We got the cheapest standing tickets, up in an area next to the locals, and it was fantastic. We had a great view of the fights and the atmosphere was awesome, with locals enthusiastically cheering on their favourites. There were even a few knock-outs, ending the fights abruptly after a couple of rounds. 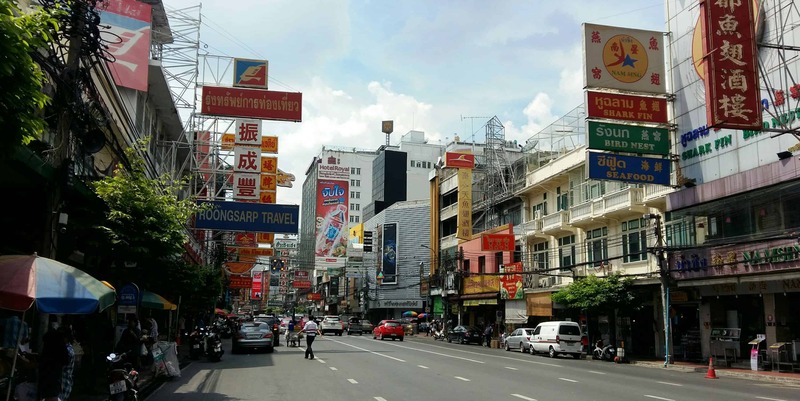 It might be touristy but Khao San Road is still the heart of the backpacker scene in Bangkok. It is a place unlike anything else in the city, with streetfood vendors calling out to you, people trying to lure you into their shops to sell you souvenirs or suits and bars competing with each other about the cheapest cocktails sold in buckets. The street fully comes alive in the evening, after it gets dark. If you find it too hectic, I recommend you wander a bit and check out one of the nearby, smaller streets. Bangkok is well-known for its excellent streetfood and it is hard to go out and find anything but amazing food. Most travellers will sooner or later find the Pad Thai stands on Khao San Road, but there is so much more to discover. From Thai pancakes to meat on a stick or insects, you can find lots of different dishes being sold all over the city. If you wander the street, going into different neighbourhoods, you can discover real treasures. And if you want to taste as much streetfood as you can, there are even tours you can take. The house of Jim Thompson is an oasis of quiet in otherwise hectic Bangkok. Jim Thompson used to be a spy for the CIA. He eventually settled down in Bangkok where he discovered an interest in silk and tried to preserve as much of the art of silk weaving and printing as possible. The house, located at the riverfront, was assembled from various traditional houses in the area. A visit allows you to see the typical architecture as well as see various pieces of art that he collected over the years. You need to take a guided tour to see the house. They run regularly so you won’t have to wait for long. 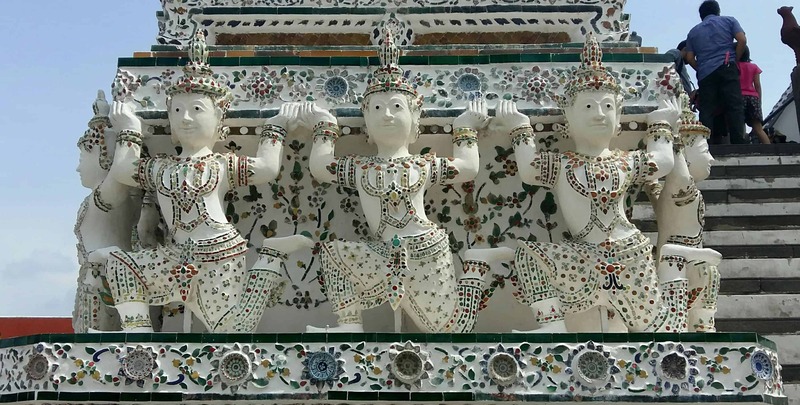 Wat Arun, also called Temple of the Dawn, is only a short ferry crossing away from Wat Pho. The site has been a place of worship for centuries, although the temple as you see it today has only been constructed in the 19th century. With its white pagoda covered with colourful tiles, it looks different to most other temples in Bangkok. Don’t miss the other buildings of this temple complex, all beautifully decorated with only few tourists around. Chinatown is different to the rest of Bangkok. With Chinese signs on the roads and gold shops everywhere, it feels as if you had walked into a different city. In this area, you can find Chinese markets and a lot of delicious street food. It is especially worth coming here in the evening, when hawkers set up their stalls, to try the various dishes that they will prepare directly in front of your eyes. Bangkok is home to many malls, and MBK mall might be the most famous one. It spreads out over eight floors and supposedly houses more than 2000 shops. Most of them are tiny and some areas resemble the markets you can find in the streets. If you need to buy anything, whatever it is, you can find it here. And if you are exhausted from all that shopping, stop by in the food court on the upper level. 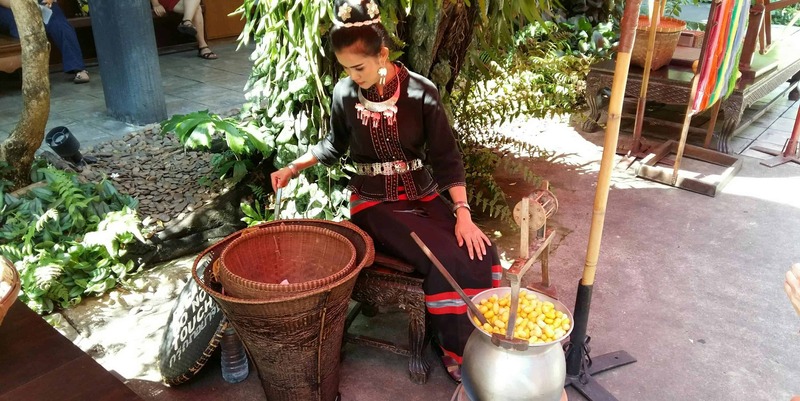 They prepare great and authentic Thai dishes there. Bangkok houses many floating markets and seeing one is a highlight for many visitors. Every hotel or travel agency can arrange half-day trips to see one. They will often take you out of town to the touristic markets. If you want a more authentic option and happen to be here on a weekend, try Taling Chan or Khlong Lat Mayom. Both can be reached by public transport and are frequented by locals, too. The Royal Palace is one of Bangkok’s main tourist attractions. It contains a beautiful temple, decorated with gold and many colourful pieces of glass and stones. Plus, the walls are painted with murals showing many scenes related to Buddhism, temples and the palace. The Royal Palace is wonderful to visit – if you come very early in the morning. Unfortunately, we arrived too late when the tour buses had already gotten there. Instead of admiring the architecture, we then spent an hour fighting crowds before fleeing from the sight. I already mentioned that when I first arrived in Bangkok, the city looked very grey to me. Amidst the run-down buildings and the heavy traffic, I was missing trees and plants. Visiting a park is a great opportunity to escape the city and relax. The biggest and most popular one is Lumpini Park, an oasis of green in between the streets and houses. Bang Pa-In Palace is located 60km north of Bangkok and can easily be visited in combination with a day trip to Ayutthaya. Most of the buildings were constructed in the late 19th century by King Rama and it was used as a summer residence to escape Bangkok’s heat. What makes the summer palace so interesting to visit are the different building styles. From Thai to European and Chinese, each house has its own specific style. Some can also be visited from inside while others are closed to visitors. Ayutthaya, located north of Bangkok, used to be the capital of the Kingdom of Siam until it got destroyed by Burmese invaders in the 18th century. It can be visited as a day trip from Bangkok and you will find many travel agencies all over the city willing to take you here. Trips include visits to several temples and pagodas located all over the city. We had a great guide, too, who provided information about the history of the ruins we visited. When booking the day trip, ask about one that takes you to Bang Pa-In Palace as well. 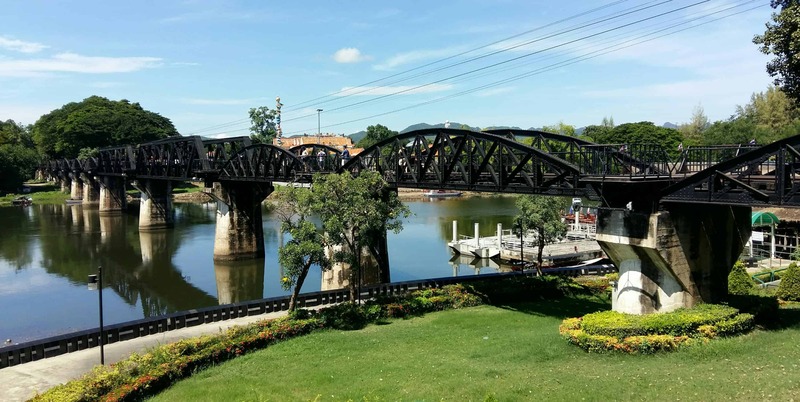 The bridge over the River Kwai is another day trip from Bangkok. It was built during World War II, when Japan occupied parts of Thailand and used prisoners to construct a railway to Burma. Our day trip included a visit to the graveyard (hundreds of people died here as war prisoners) and a ride on the death train. The tracks have a horrible history, but the view over the valley is amazing. As with Ayutthaya, you can easily arrange a day trip with one of the many travel agencies in Bangkok. I love this post. It is incredibly helpful guide for Bangkok trip! I visited almost all of the places except the last 2. Will check it out too! Thank you for sharing! Thank you very much! I’m happy to hear you find it helpful and I hope you enjoyed your time in Bangkok.